Enriched Air Diving – Is It For You? Home/News/Enriched Air Diving – Is It For You? Enriched air, what is it? Nitrox is any gas mixture composed of nitrogen and oxygen. This would include air which is 21% oxygen, 78% nitrogen and 1% trace elements. Though nitrox is considered mixes that are either above or below the percentage of air, enriched air tanks are filled with mixes that are above 21%. Enriched air nitrox has been around since the 1920’s and 30’s. Dive manufacturer Draeger made a nitrox backpack independent air supply for the standard diving suit. Later in World War II, British frogmen and work divers used the increased oxygen mixes in their oxygen rebreathers. It has only been in the past twenty to twenty-five years that enriched air has found a place in the recreational dive market. At the beginning, it was considered dangerous by some, and blacklisted by most of the major scuba training agencies including Padi and Naui. However, over time, all scuba training agencies have come to embrace enriched air, and the advantages of using the gas over standard air mixes. 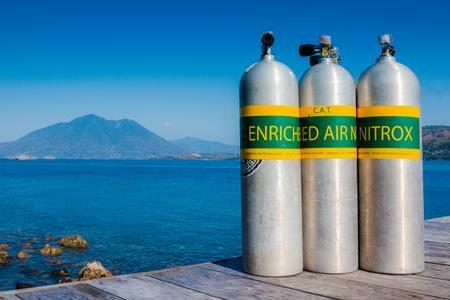 Diving enriched air has a number of advantages over the use of air in our scuba cylinders. For one, it increases your bottom times, and shortens your surface intervals. By doing so, multiple dives can be done over the course of the day, safely, by the diver! It is necessary that the diver uses the proper tables, or computers, and the learned protocol. Enriched air has been known, on a subjective level, to provide less fatigue at the end of the dive, due to less nitrogen formation in the body. Independent studies are inconclusive, but overall, do not support the theory. However, some experts have said, that due to the increased oxygen in the mix, enriched oxygen mixes can increase exercise tolerance, during aerobic exertion. So fighting a current, getting back to the boat, the gas could assist a diver in getting back with less work of effort. More research needs to be done, to really find out completely, all the advantages of this wonderful gas. The Professional Assoc. Of Dive Instructors has stated in the Padi Enriched Air manual, that the incidence of decompression sickness (excessive nitrogen bubbles in the body tissue) is so low that enriched air doesn’t really make it safer than air. Interestingly though, Padi also states that even though using the recreational dive planner or computer conservatively, no one can guarantee that you won’t get decompression sickness. There are too many physiological factors that can affect divers such as age, weight, sickness, excessive activity, carbon dioxide retention, and dehydration. These factors can potentially hasten decompression sickness. There are many divers that like having the extra edge of safety that enriched air provides. The mixing, analyzing, labeling and logging of your mixes certainly adds more planning in using enriched air. Such is the importance of taking the SDI Computer Nitrox Course, so you can do this safely. More important however, is the potential hazard of oxygen toxicity. If the enriched air oxygen content for the depth that you are diving is too great, there are risks for seizure, and potential drowning. The advantage of taking the course will allow you to understand, and plan for your maximum operating depth for whatever percentage of oxygen one has in their cylinder. Toucan Dive will be teaching the SDI Computer Nitrox Course starting on Tuesday, January 22nd, at 6:30 PM. at Toucan Dive. The price for the course is $100.00 plus your SDI materials.